Hop on over to our annual Newcomers Easter Egg Hunt! Kids of all ages are welcome. 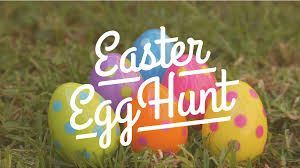 There will be 2 separate hunts divided by age groups and everyone is guaranteed a bunch of eggs and treats (both edible and non-edible). There may also be a visit from a special, long-eared guest so don’t miss out on the fun! (This event will happen rain or shine since we have a great pavilion space reserved in case of inclement weather.) Be sure to register today!